Not loving how shapeless and weird the sarong/scarf looks in these pictures, but trust me, it looks alot better in real life. 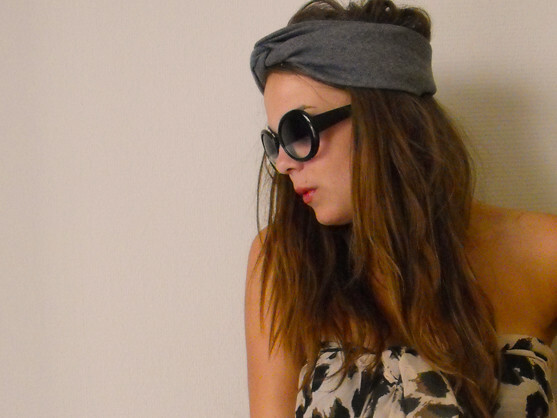 I've been practically living in this sarong and my shorts that I posted two outfit posts ago! I've been experimenting with various ways to tie sarongs over the last few days. This is probably my favourite, just simply tied round the bust and then knotted a few times at the front. I bought this thinking it was a scarf, and bought it with me on holiday to wear on the plane. We all know I have a serious leopard print addiction! So it seemed like a perfect inter-seasonal piece, well that's what I told myself! Oh, I got a email the other day from the H&M mailing list saying that they are opening a online H&M store for the UK in September! Which is absolutely amazing! As much as I love H&M I find it hard to look for things in store because everything like... put together on the shelves. Like its not like one t-shirt on one rack, one dress on one rack. Its all bunched together and its so easy to miss things! I find myself shuffling through the rails to find things which frustrates me! Also H&M may have to sort their sizing out a little before I'd feel really comfortable buying online with them. However, its good news, I've been wanting a online H&M for yonks, so I'm pleased! I feel so Frassy right now! Seriously I may as well be Audery in these pictures, Which was my intention but she has serious style, So if you don't follow her I defiantly would go and do it! I cant wait to come home. Its starting to grate on me right now, Its getting too hot, even though its boiling at home. Its also annoying being with the family 24/7, and I relish the fact I can spend a good 30 mins alone while being on the internet! Oh well, two days till I leave, 3 till Im home! ooo i love this print so much! i own no leopard print, but seeing you in this makes me want to! very creative way to make a dress! i would have never guessed it was a scarf! you look adorable! Haha I did this the other day - used a scarf as a crop top. I refuse to buy crop tops, just chop something or get a fabric and tie it around yourself.. Ha. lucky! i sure hope h&m opens and online shop for Canada!! i would just die of happiness! Clever idea! looks very chic as well. So pleased about online H&M but I agree about the sizing, it's always so bipolar. Super cute!! LOVE the headband, love how you wear it. I was so chuffed to get the email from H&M and thought exactly the same as you - should be easier to spot the good items than in the store (which is always badly laid out). I saw those glasses on the site you got them from a while ago. What are they like in real life? I am really tempted to get some. They look great on you. You are too sweet...that is very kind of you! I know Francesca Sloan who owns and makes everything for Babooshka, and she would LOVE how damn well you are wearing one of her turbans! Amazing sunglasses too. love this .. check out my BLOG . www.lechateauamethyst.blogspot.com im going to put you on there ... keep up the BEAUTIFUL work!!! Obat Kuat Hammer merupakan produk no : satu UNTUK DISFUNGSI EREKSI, 100% berbahan alami sehingga menjadikan produk ini mendapat sertifikat resmi produk Obat Hammer Terbaik yang sangat aman untuk dikonsumsi oleh siapapun termasuk oleh semua usia.